This week on the farm we went on a field trip to Sequim to see Noahs’ Farm. Noah is a good friend of ours who has recently bought a 70 acre farm and already has two draft horses and two (soon to be trained) Oxen. We were inspired by the vision that he and his farm partners have for the future of the land and re-inspired for our own relationship with this land and the work we are doing here on Whidbey Island. After all- we are all working toward the same goal of re-localizing our food system and providing the opportunity for good people to be supported by good farmers who are caring thoughtfully for the precious thin layer of dirt on earth that ultimately feeds us all. Noah is moving forward in engaging in relationship with animals to help him care for his soil. We are also working with animals in relationship to our farm. And last week we promised to begin the story of our most special chicken…. Truffula arrived at our farm, a Seattle transplant among a flock of five. She was at the bottom of the social ladder (and social ladders matter in chicken circles) amongst her original flock and when she moved in with our larger flock of 11, she moved right to the bottom. She was nervous, flighty and always being chased away from the food. The other hens began to pull her feathers out and she developed a bald spot on her back. It was harder for her to see the world through her great shaggy mop of feathers and she was constantly peering and jerking and darting her head around in the effort to avoid these attacks. 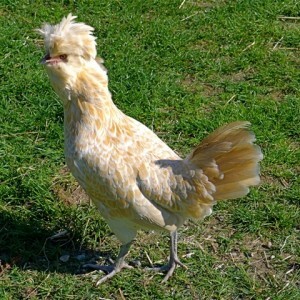 But Truffula was destined for greatness and she just wouldn’t take this hen pecked life laying down. Nope, not Truffula. She up and flew the coop. See, she is a slender bird and is more able to fly than the other heavier hens so when she discovered that she didn’t have to put up with this misery, she didn’t. So where did she go? Well after wandering around the farm for a few weeks she found her way into the. . .turkey pen. Find out what happened then, next week….Stay Tuned! This entry was posted in Uncategorized on June 26, 2013 by Beth.